Nobody thought this would ever happen, I’m sure. But Chandelure, a Ghost/Fire Pokémon that attacks opponents’ spirits, is joining Pokkén Tournament as a playable character. Bwah? Since Pokkén Tournament is an arcade fighting game, you’d probably expect Pokémon able to throw punches and kicks—or, at the very least, an actual body to take blows. Yet here we are. It was originally teased that the new Pokkén Tournament character would have the Japanese character “ra” (ラ) in its name, leading people to think Swampert (ラグラージ or Raguraaji in Japanese) would be appearing in the game. As My Game News Flash points out, Swampert (ラグラージ) started trending in Japan. 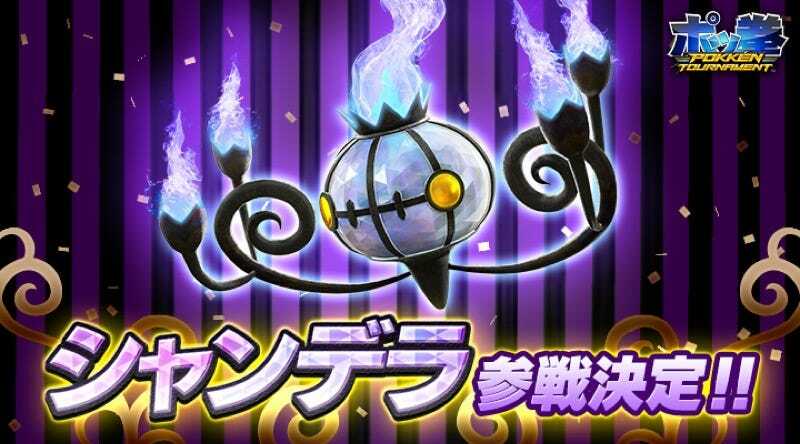 But...the new character is Chandelure (シャンデラ or Shandera in Japanese). See how Swampert is bewildered in this fan art? Chandelure doesn’t physically burn opponents, but hypnotizes them and absorbs their spirits. We’ll get a first look at how this all works at the upcoming Tokaigi Game Party later this month in Japan. This is such a left field choice, I’m kind of keen to see how the character will work in the game. Don’t let up now, Pokkén!